A basket of washed laundry is sitting in my closet for one week. Daily I am getting into the closet and pulling out clothes to wear at work and simply ignoring the full basket of washed clothes which is staring at me since last week it was placed there. Am I the same person? How did I change so much? I was not like this, years ago. Huh…. good old memories of school and college days...It was well organized and things had its place and no pile up of anything. Well ironed clothes and perfectly organized closets and speck free study table. Wait a minute, the only thing I had to do was to study, nothing else to worry. Let me come back to the current scene. I am a Mom. Of course the priorities have drastically changed now. Before you never had to worry about what comes on the dining table, you just had to sit there when the meal was ready, but now you are responsible for getting the meal to the table accompanied with lots of chores and responsibilities. Oh yeah, that's a pretty good excuse to ignore the pile of clothes. My excuse seems to be reasonable and it is trying to convince my conscience. But still a tiny bit of guilt is poking me from inside when I see the full basket every day. I have to get it folded tonight, period. NO MORE EXCUSE!!! I am sure all Moms had gone through this dilemma of prioritizing things or there are some chores she wish to completely skip or hate to do. She never finds enough time. I wish the day was extended little more. Hope I am not the only one who thinks this way!! Today I am sharing a recipe that I have been making for years. I am not sure why I didn't post this earlier. This is a simple yet nutritious and delicious curry that can be served with rice or Indian flat bread like Roti. The ingredients of this recipe are similar to the traditional Kerala Erriserry, which is simply a thick coconut based curry made with beans and a vegetable. The traditional Erriserry uses either pumpkin or green plantain. 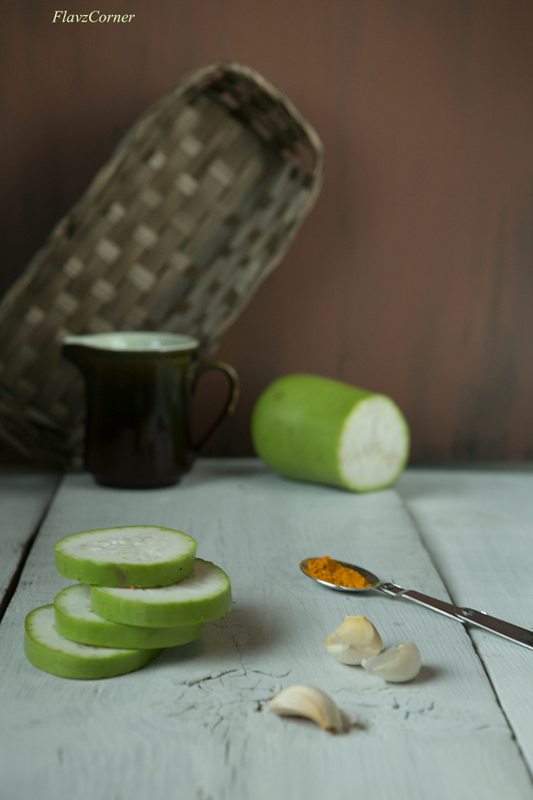 This recipe uses protein rich green grams and bottle gourd; this curry is not as thick as the traditional Erriserry. It takes long time to cook the beans and vegetable to get the desired consistency when made in earthen pots in those days. But now with the use of pressure cooker, this curry can be prepared in a jiffy. Give this recipe a try and let me know how it turns out for you. Soak the Moong dal/ green gram in water for overnight. Add 3 1/2 cups water and soaked Moong dal into a pressure cooker and cook till 4 whistle blows. 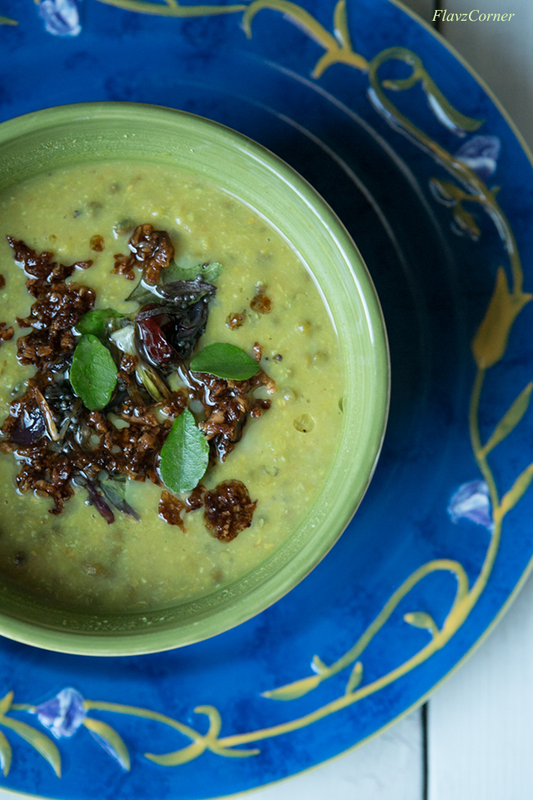 If you forgot to soak the moong dal, don't fret. Cook the washed Moong dal with 3 1/2 cups of water till 8 whistle blows. Turn off the stove and let the beans cool down completely. Use a ladle or potato masher to mash the moong dal. Add the chopped bottle gourd/lauki, turmeric powder, tomato, green chili, garlic clove, salt and 3 cups of water. Pressure cook again till 3 whistle blows. Turn off the flame and let the pressure subside. Meantime grind all the ingredients from the 'To grind' list into a very smooth paste. Open the pressure cooker after all the pressure is gone. Add the ground coconut paste and cook for 5 minutes or till the curry comes to rolling boil. Adjust the amount of water and salt during this time. Turn off the flame. Transfer the curry into a serving bowl. Prepare tadka in a non stick pan by spluttering the mustard seeds in 1 tbsp. of oil. Lower the flame and add the sliced shallots, red chili and grated coconut. Cook till it gets light golden brown color. Turn off the flame and add the curry leaves. 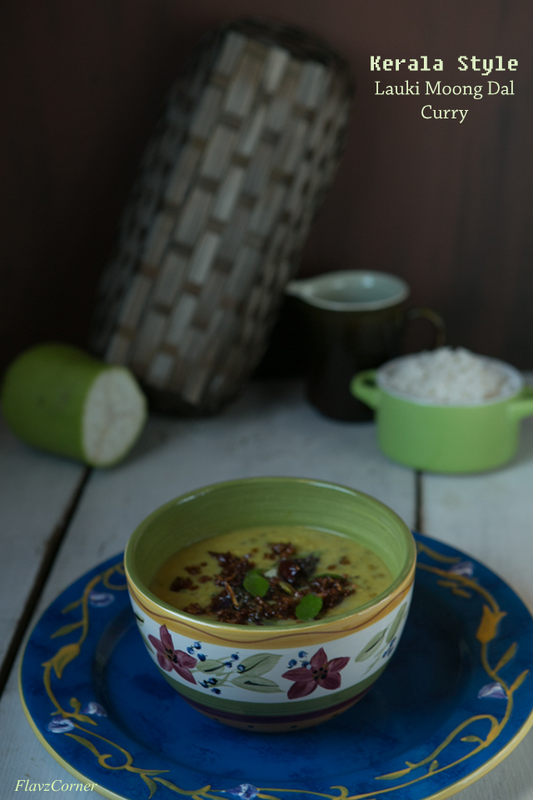 Pour the tadka over the Lauki Moong Dal curry and serve with steamed plain rice or Indian flat bread like Roti/Chapathi. The curry gets thicker as it sits. So adjust the amount of water per desired consistency. I like this curry to be very thick when serving with rice. You can increase or decrease the amount of green chili in this recipe per your taste. Sometimes I skip the green chili and grind fire roasted red chili. This adds a nice flavor to the curry. I like the addition of curry leaves and fresh coconut in the tempering of this dal. I make lauki ki dal but using chana dal with it. Your recipe sounds promising and I am going to give a try soon. I like those little green beans. The curry looks very delicious, Shibi. Love the photos of this fantastic dish! Well done!! Ohh Shibi, u r not alone... I am here with just one kid and I have no clue how the day went by ...and I am still not done with what ever chores I would have thought of doing for the day... I can imagine, ur case...I must say u r a super mom...:).. I so so rarely use coconut in dals! Something I should do more often -- such a nice addition. This looks wonderful -- thanks so much. Looks delicious. I have bought fresh curry leaves at my local Indian grocery (Mayuri) and found they give a wonderful flavor that nothing else can. For a while I had them in my freezer to add to things. Next time I am at Mayuri I will pick up some more. 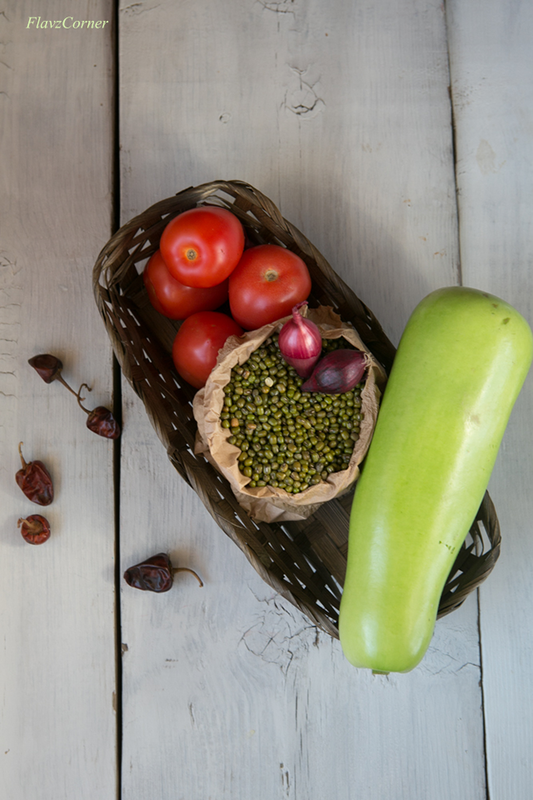 I haven't used mung beans (green gram) in a long time and I've never used bottle gourd, though they sell it at Mayuri. I should pick up all three and give this dal a try. Meanwhile saving the recipe on Pinterest, thanks!